To put a tile along an arc use the P1 symmetry with one row of tiles. Check the Exclude tile box. 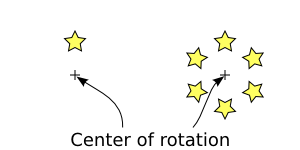 The Rotation center is used as the center of rotation. The base tile is drawn on the left, showing the Rotation center of the tile. On the right is after a P1 tiling with a per column shift removed by checking the Exclude tile box and with a rotation of 60%. 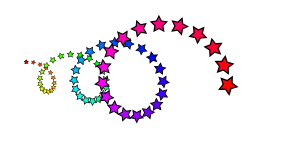 This trick can also place objects along a spiral by specifying that the tile should get larger with each column. 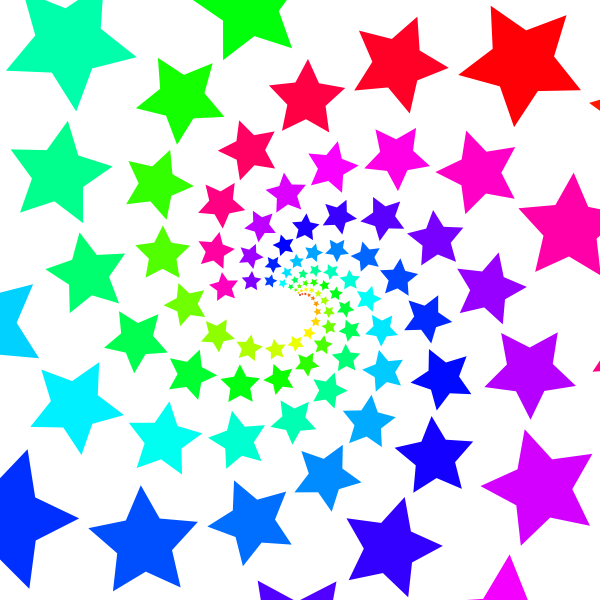 One can put the stars on a logarithmic spiral so that the stars don't run into each after several loops. 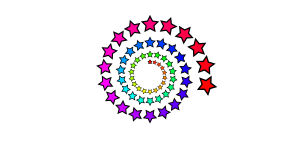 A “P1 symmetry” tiling. 8 rows, 21 columns. Rotation of −11.5° per row and 20.6° per column, Scale of 39.3% per row and 24.2% per column with a Base of 2.7 for both x and y. The pattern matches that for a pine cone with 8 rows in one direction and 13 in the other. For the mathematicians: note that 13 times the per column scaling is equal to 8 times the per row scaling and that 13 times the per column rotation minus 8 times the per row rotation is equal to 360°. 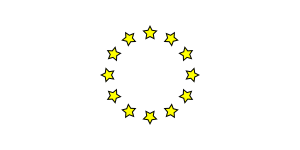 This is due to the constraint that the 14th star in the first row is the same as the 9th star in the first column. 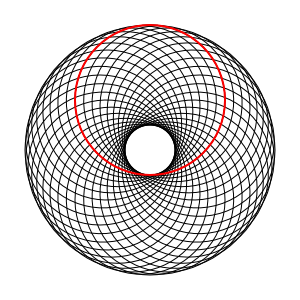 A circle tiled on an arc. The red circle with the Rotation center moved off center was the source tile.